Virginia Sweetspire is a nice selection of shrub that I have been planting professionally since I attended Ohio State University. This shrub features oblong leaves with white flowers in the late spring. The Autumn color is note worthy producing beautiful oranges, reds, and scarlet. Virginia Sweetspire is a good selection for foundation plantings and mixes well with boxwood. 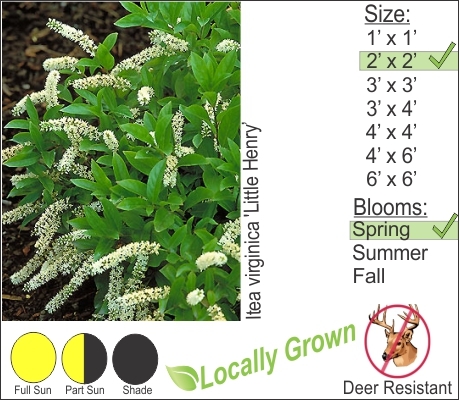 This shrub is also deer resistant and easy to maintain.